Made a trip up to Rockwall yesterday. I was hoping the kite surfers were out, but it wasn't windy enough. I was able to use my new zoom lens to get a shot of the Dallas, Texas skyline. This was taken on an overpass of I-30 just east of Lake Ray Hubbard. 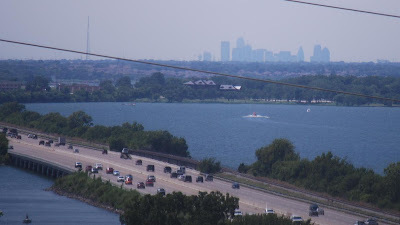 The skyline is about 20 miles away by highway, probably less than that using a straight line. If you are looking for results from last nights Terrell Tiger - RL Turner Lions football game head over to the Terrell Tribune, Cliff has his recap posted. Obstructed View has great photos of the game. Next Friday the Tigers continue tour 2009 with a road game in Paris, Texas against North Lamar. I love this post, it shows us how people from Wisconsin really feel about Brett Farve going to Minnesota.